Heat oven to 375°F. Spray 8 regular-size muffin cups with Crisco® Original No-Stick Cooking Spray. In medium bowl, mix preserves, golden raisins, dried cranberries, pecans and nutmeg until well blended. Separate dough into 8 rolls; reserve icing. Place 1 roll, cinnamon side up, in each muffin cup; firmly press dough in bottom and up side of each cup. Spoon apricot mixture into each cup. Top each with cream cheese cube; press in lightly. Bake 13 to 20 minutes or until golden brown. Remove rolls from pan. In small microwavable bowl, microwave icing on High 10 seconds. Drizzle over warm rolls. 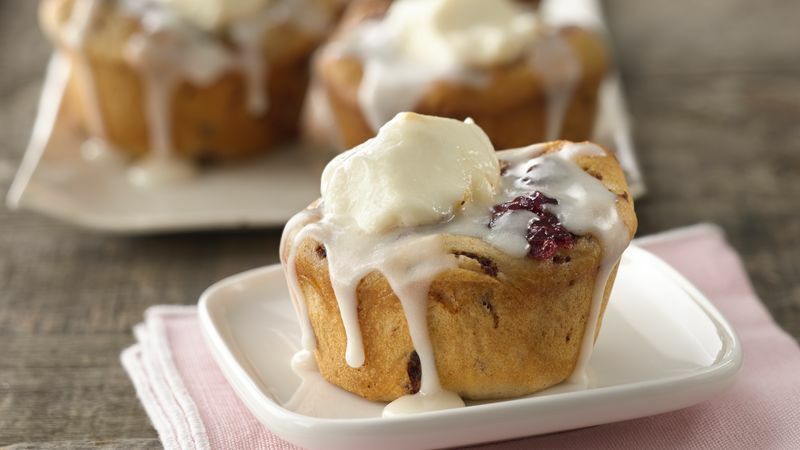 Use a 1/4 cup dry measuring cup to press each cinnamon roll into the muffin cup.